If there is any area of my digital life that I absolutely, positively must have in perfect order it is my computer files. 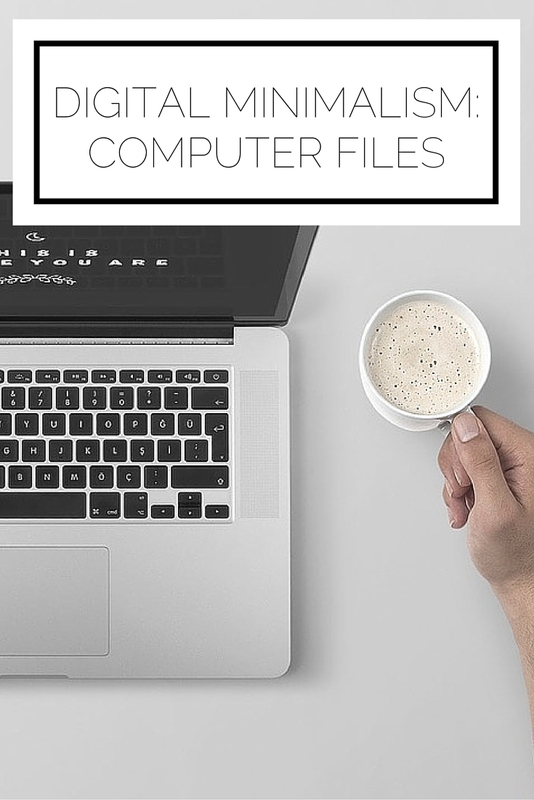 As a blogger and student my files can get crazy very fast which is why it is essential to take a minimalist approach with organization. As always, I'll share what I do and the underlying principles but you'll have to experiment and modify to find out what works best for you. Can this be accessed elsewhere? For example, did you at some point download an e-book that you haven't referenced in a while and which you can still get from the original site? If you answer yes to the first or no to the second then go ahead and delete that file! If you're not going to miss it don't hesitate to make way for other files or even to leave some space so your computer can run that much better. Blog- with subfolders of images (with subfolders by year), backups, elements (like my about images, header, etc), traffic information, guest posts, and stock photos. Taxes- with subfolders by year. Professional- with a subfolder for resumes. Freshmen, Sophomore, and Junior Year- I further divide it by semester and then by class. High School- with a folder for college applications. Organizations- divided into folders for each organization I'm involved in. Uncategorized- for any random files which don't neatly fit into a category. This is the most important part by far. I use Google Drive for all of my files which makes life so easy! If you install Drive on your computer your files are automatically saved to your google account and you can access them from anywhere you have an internet connection. The peace of mind and convenience this provides really can't be overstated. The most important lesson is to keep it simple and allow your organization to be intuitive! Check out more digital minimalism posts here!